At Next Generation Insurance Group, we’ve used digital as a point-of-sale and point-of-quote for insurance products since our founding. As you might imagine, the ecommerce and user experience landscapes have changed dramatically during that period, but nowhere is that change more dramatic than in the use of mobile by insurance buyers. It’s clear after an analysis of our own data that there has been a tectonic shift in the hardware preferences of insurance prospects over the past five years. Let’s first check out GradGuard.com, our higher education business at NGI. GradGuard is the leading consumer-centric insurance and benefits solution designed to meet millennial consumers where they are, not only across different platforms but also product verticals. The peak season for GradGuard products is May through September. In 2010, mobile comprised a paltry 1% of traffic to GradGuard.com during the site’s peak season. One percent! Half of one percent of the site’s conversions occurred on mobile devices. In present terms, it’s intuitive to state that in order to meet millennials where they are, your company needs a strong mobile practice. (This we luckily have at NGI.) But looking back to 2010, it’s easy to understand why we paid barely a passing interest to mobile. Fast forward to peak season 2015, which just concluded: 38% of traffic to GradGuard.com originated from a mobile device and 16% of all insurance policy sales occurred via a mobile device. 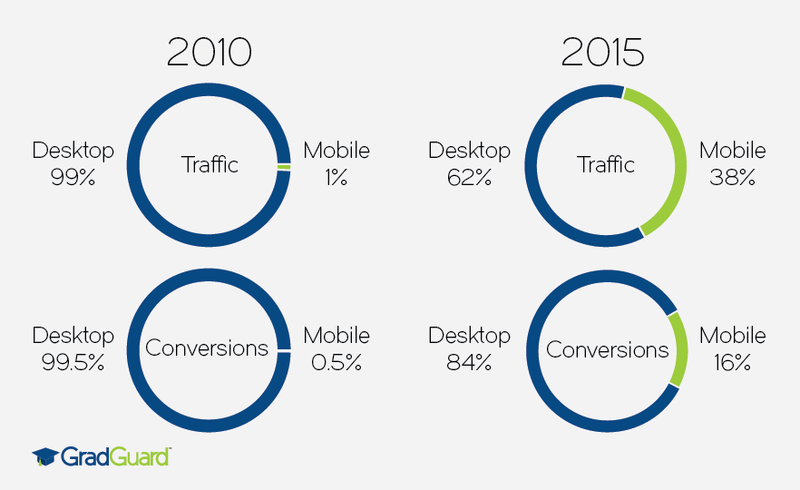 Five years ago, 1% of GradGuard.com’s traffic came from mobile. Five years later, 16% of its SALES came from mobile. It’s crazy. I looked at the last three months on MassDrive.com versus the same period in 2010. From 8/1/10-10/30/10, less than 2% of traffic to MassDrive.com originated from a mobile device. Like GradGuard, less than 1% of conversions overall were generated on a mobile device. 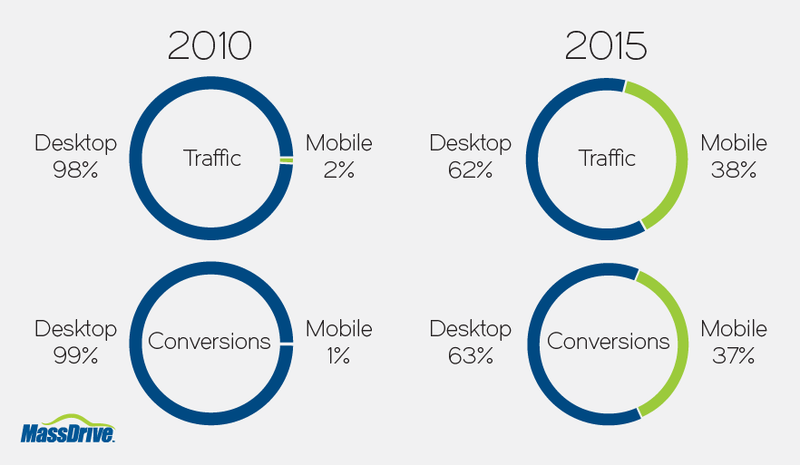 Times have changed in 2015; for the same period this year, 38% of traffic to MassDrive.com came from a mobile device and an unbelieveable 37% of total conversions occurred on a mobile device. These and similar data points are impacting how we market and approach our process and experience designs at NGI. What was something of an afterthought five years ago is now an active part of our creative, engineering, and QA operations. The data tells us that insurance prospects are ready to buy on mobile – we’re focused on capturing them with an experience worthy of that expectation.